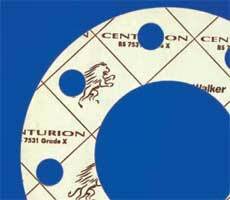 Centurion® is a high performance sheet jointing, based on glass and aramid fibres with a nitrile rubber (NBR) binder. An anti-stick finish to both surfaces is supplied as standard. • Well proven on industrial plants worldwide. 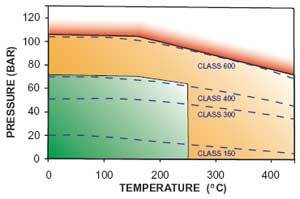 • Chemically and thermally stable for duties up to 440°C. • Recommended for most fluid media. 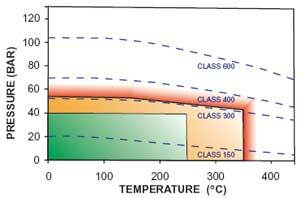 Meets the requirements of BS7531 Grade X.
working pressure against temperature guidelines. For applications falling into the green zone of each graph, the product may normally be used without consultation. In the amber zone we recommend that our technical services team be contacted for confirmation of suitability. 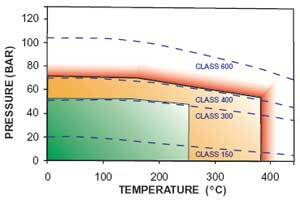 If the pressure/temperature combination is in the red zone then we must be consulted before the product is used. 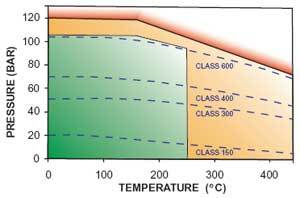 Class lines refer to ASME B16.5.